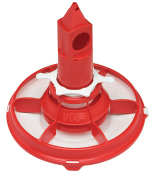 Introducing the Valenta feed pan from VDL! Versatile broiler feed pan designed for both restricted and unrestricted feeding. Low ridge for easy access to feed from day one. Open design prevents chicks from getting caught inside the feed pan. Pan design minimizes feed spillage. Simple 6 position feed level adjustment. User friendly, automatic flooring mechanism. Smooth surfaces for easy cleaning and disinfection. The only 58 mm high ridge of the feedpan allows easy access for all day old chicks to the feed. A perfect start is herewith guaranteed. Absence of the grill prevents birds from getting caught inside the feedpan. Feedspace design ideal also for heavier birds. Smooth surface facilitates cleaning and disinfection. 6-position feed level ring for accurate and easy feed level adjustment. Design of the pan ridge, inclining pan bottom and 6 wing feed divider prevent feed spillage.